(January 10, 2015)- Cape Coral Police Department have made an arrest in a shooting that occurred on a north Cape Coral roadway on January 7th. On Wednesday at around 1:10 PM, Cape Coral Police were dispatched to the Dollar General at 2328 Andalusia Blvd in reference to an active shooting. According to the complainant, he was in a vehicle with friends when someone pulled up next to them and began to shoot at their vehicle. The complainant stated that he and his wife were passengers in the car. They were going southbound on Andalusia and when a blue car pulled up next to them near the 1100 block and began shooting at the car. The complainant told Police that he saw the car and that it was blue in color. He did not see who was shooting the gun and that once he heard all the shots, he ducked down to take cover. The wife told Officers that she did not see the vehicle or the shooter and that once the shots went off she was trying to duck and hide. Both were in fear for their lives. The driver of the car, and victim of the shooting, stated that he was driving and he heard several loud noises and "pings" hitting his car. He said that he looked over and saw a "skinny black male with long dreds," driving a blue dodge neon, pointing a gun at him and firing. The victim told Officers that the male shooting at him was someone that he knew as "J". The victim then drove into a field to avoid his vehicle getting hit any more. After he pulled into the field he saw the vehicle flee southbound on Andalusia Blvd. The victim stated that he wanted to get the vehicle information so he began to follow the shooter's car. As he was following the vehicle, the victim saw the Dodge Neon in the parking lot at Golden Corral at the corner of Andalusia and Pine Island Rd. He saw "J" standing outside the vehicle talking to someone else in a gray Mazda. "J" saw the victim's vehicle pull into the parking lot and he got back into the blue Dodge and drove away. The gray Mazda followed the Dodge out of the parking lot. The victim told Police that he followed both of the vehicles. While he was diving, the victim said that he began to feel warmth in his shoulder and at that point realized that he had been shot in the left shoulder. The victim stopped chasing the vehicle and pulled into the Dollar General and waited on Police and EMS and was transported to Lee Memorial Hospital for treatment. He told Officers that he would press charges. A check of the vehicle showed that it had been hit at least 9 times. While Officers where on scene at Dollar General, they observed a gray Mazda with two black males in it, fitting the description that had been provided by the victims. A traffic stop was conducted; the two males inside the vehicle were a Johnie L. Neal Jr. and Rondre R. Thomas (DOB 2/28/95). A show-up was conducted with the complainant. He positively identified Rondre Thomas as "J," however he did not see who had actually shot at the vehicle. Field interview cards were completed on both Thomas and Neal and both released from the scene. On Friday, Detectives went to the victim's residence and showed him a photo lineup consisting of six photos including that of Rondre Thomas. Richard immediately picked out Thomas as the black male that had shot him on January 7th. Detectives established that there was probable cause to charge Rondre Thomas with Shooting into a occupied vehicle F.S.S. 790.19 2nd Degree Felony, Aggravated Battery with a Deadly Weapon F.S.S. 784.045 (2) 2nd Degree Felony, and Aggravated Assault F.S.S. 784.021 (1) (b) 3rd Degree Felony (2 counts). On January 9, 2014 at around 8:25 PM, Cape Coral Police Department Patrol Officers conducted a follow-up on this case at 424 SW 23rd Ter., where Officers believed Thomas to be. While setting up a perimeter with several officers, a vehicle left the residence at a high rate of speed. Officers conducted a traffic stop on the car in the Walgreens parking lot at 2409 Santa Barbara Blvd S.
A short time later, a gray SUV pulled up and multiple people exited. Officers immediately recognized Rondre Thomas, who got out of the passenger side of the vehicle. Rondre Thomas was arrested for the above listed charges and transported to the Cape Coral Police Department for booking. While at the Cape Coral Police Department, Detectives responded to question Thomas. Thomas was later transported to the Lee County Jail. 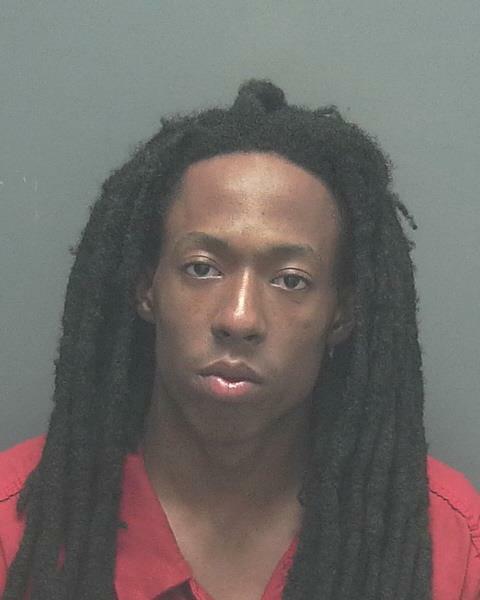 ARRESTED: Rondre Royal Thomas (B/M 2/28/1995), of 424 SW 23rd Ter., Cape Coral, FL.